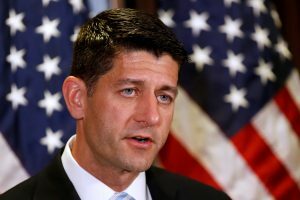 WASHINGTON — House Republicans reversed themselves Tuesday under pressure from President-elect Donald Trump, and dropped plans to swiftly gut an independent congressional ethics board. The dizzying about-face came as lawmakers convened for the first day of the 115th Congress, an occasion normally reserved for pomp and ceremony under the Capitol Dome. Instead, House Republicans found themselves under attack not only from Democrats, but from their new president, over their secretive move Monday to immediately neuter the independent Office of Congressional Ethics and place it under lawmakers’ control. GOP leaders scrambled to contain the damage, and within hours of Trump registering his criticism over the timing on Twitter, they called an emergency meeting of House Republicans where lawmakers voted to undo the change. The episode, coming even before the new Congress had convened and lawmakers were sworn in, was a powerful illustration of the sway Trump may hold over his party in a Washington that will be fully under Republican control for the first time in a decade. “With all that Congress has to work on, do they really have to make the weakening of the Independent Ethics Watchdog, as unfair as it may be, their number one act and priority,” Trump had asked over Twitter Tuesday morning.